Shakespeare wrote the famous “All the world’s a stage” monologue from As You Like It aged 45, old age for the time, middle age now. This wonderful reflective monologue about the life and death cycle was in my mind as I went to visit the Highgate Cemetery in London. What is indeed our legacy after we die? With a good many of the 7 ages already behind me, this is no longer a neutral interrogation for I, too, will be “sans teeth, sans eyes, sans taste, sans everything” sooner or later; second option preferred. The first thing that struck my mind as my tour entered the Highgate Cemetery was, how can something so beautiful emerge from death? Would it be wrong to call a cemetery stunning? Yet Highgate is stunning in many ways. As our guide stated, it has been maintained in a state of managed wilderness. In this case, overgrown vegetation is to unkempt stone what the sunset is to the small island of Capri, quite the perfect visual balance. Ultimately, what surprised me most is that life is everywhere in the cemetery. The green bushes and trees seep life into crevices and split stone, cracking death under their powerful jaws. Birds perch lightly on heavy Celtic crosses and egg shaped headstones. Forgotten tombs were ignited by hundreds of flashes from our tour as if being paparazzied. More importantly, the stories keep it alive. Such one story is that of Thomas Sayers (1826-1865), a bare knuckle boxer very famous at the time who has a life size statue of his beloved dog Lion guarding his tomb like Cerberus guarded Hell. A lot of rich families buried their loved ones with pump and circumstance in the cemetery and the architecture that was left behind is the most impressive I have seen. More impressive than that of the Père Lachaise cemetery in Paris for instance. The Egyptian alley and the circle are incredible features that add to the uniqueness of the place and you simply have to see it for yourself the marketing folly that it was. I only wished I had been able to wander alone in the cemetery and for much longer than one hour but the tour’s guidelines are strict. Everybody stays together with the guide, no exceptions allowed. This is a tour I could take again and again though, in all seasons. Bookings are essential and tickets sell well in advance so book early if you are in London just for a day or two. The fallen angels whose wings emerge through branches give the place an air of tranquil benevolence and peace that lend a reassuring look to the place. Perhaps in the end and in spite of everything, life wins. I’ve never been to Highbury, but we visited Glasgow cemetery a few months ago. I took some pictures but I really wasn’t sure what to write to go with them that would convey the atmosphere which was just this side of creepy, despite the bright sunshine. That makes me admire your post all the more – ‘Birds perch lightly on heavy Celtic crosses’ is brilliant. Many thanks, your comment means a lot as I struggled with writing this. This is truly an amazing place. It’s on my to-visit list! 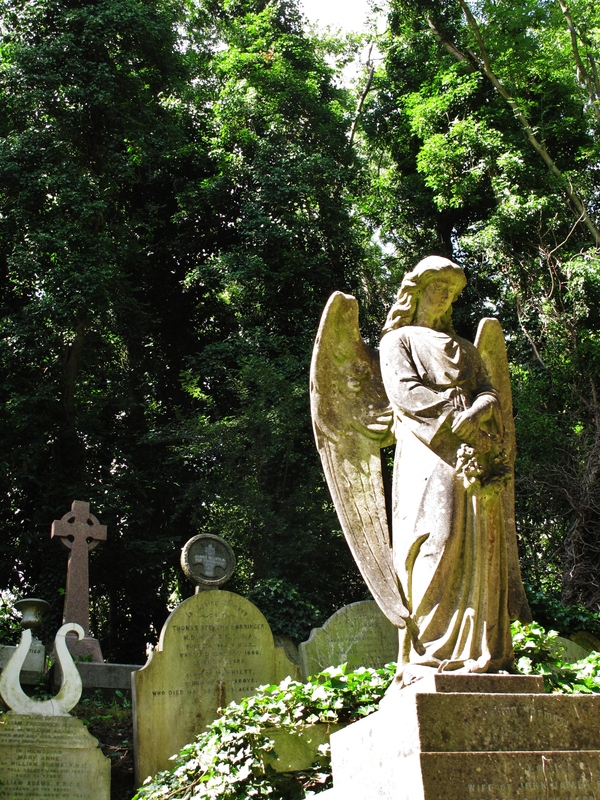 I’ve obviously lived more of my seven ages than you because when I lived in London yesterday which was in fact decades ag I regularly wandered in Highgate Cemetery all alone. Do try Kensal Rise too …. it’s a lesser known but also pretty wonderous London resting place. Lovely blog which will surely entice many to take the tour! Thanks. I envy you, I would have loved to see as much as I wanted. Is there a secret passage to the cemetery or was it simply less business orientated in the olden days…? I like that I was alive in the olden days! It was not at all commercial in those days. Clearly they saw an opportunity – is it English Heritage now? I was just teasing about the olden days of course. It’s not English Heritage, it is in fact working thanks to donations, legacies, friends of the cemetery and volunteers. I’ll check out your suggestion. This tour was on my hit list to do many years ago when we lived in London, but being south London rather than north, we never quite got there so thanks for sharing. Sublime post!I visited this magnificent cemetary some years ago,I wanted to see some tombs of famous people buried there.I was absolutely entranced by the Gothic style of some tombs and the romantic attitude all over.I was surprised though when I saw Karl Marx’ tomb there,which was adorned with some fresh red roses. Thank you so much! The cemetery is extraordinary. I’d like to see what it looks like now in Autumn. Not sure either if I would like to see Marx’ tomb again! This is one of the places I have always wanted to visit, even more so now.